INTS Fast Wireless Charger make your overall life easier,You don't have to worry about forgetting to charge the phone,You don't have to worry about where the phone is.Just on the pad.Cease to struggle and you cease to live. - Red LED Indicator Flash Once: Mobile phone is ready to charge. 1. The Fast Charge feature is compatible with ONLY Note 5 and S6 edge+, S7 and S7 Edge , Galaxy S8 S8+ models. 2. Please use QC 2.0/QC 3.0 Adaptive Fast Charger or Samsung original fast charger. And please use the cable that come with our product or Samsung original cable. 4. Please take off the phone case if you have a metal phone case or your case has a metallic coating. 5. Make sure that your device is compatible with wireless charging function. You can email us to confirm whether your devices have wireless charging capability built-in. 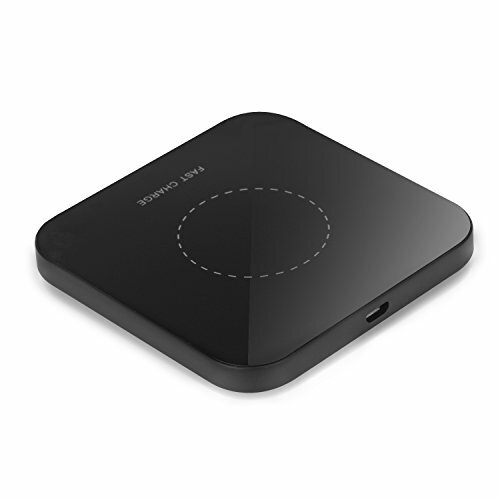 √ Sweet Charging Pad: you won't forget to charge the phone, you won't forget where the phone is.Just on the pad. √ Please Note: Fast charge modes are ONLY available for these models: Samsung Galaxy S8, S8+, Samsung Galaxy S7, Galaxy S7 Edge, Note 5, Galaxy S6 Edge Plus. Other devices will charge at standard speed. Some devices may require an additional wireless charging receiver (Not Included). √ Easy to Use: Placed any Qi-enabled devices or device equipped with a Qi-compatible cover in the right charging area, then you are free to enjoy your wireless and limitless charging experience. √ Package includes: INTS wireless charger, micro USB cable, user manual, 30 days money back & 12 months replacement warranty & lifetime support guarantee. Please contact us at first if you have any questions, we would try our best to provide you the best service. View More In Charging Stations. If you have any questions about this product by INTS, contact us by completing and submitting the form below. If you are looking for a specif part number, please include it with your message.